We know that the next few months promises some of the hottest games of the year, and that extends well into 2016. Best of all, a good portion of these highly anticipated titles have some pretty decent collector’s and special editions releasing alongside. 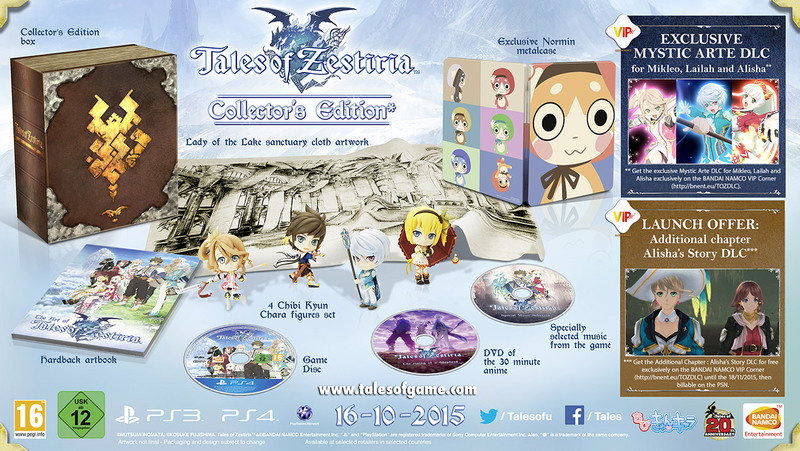 So perhaps a guide of the sorts of collector’s editions to expect is in order. These are the best of the best collector’s editions coming to a store near you, and soon. The latest in the Might and Magic franchise comes with a very exclusive figurine when purchasing the collector’s edition. 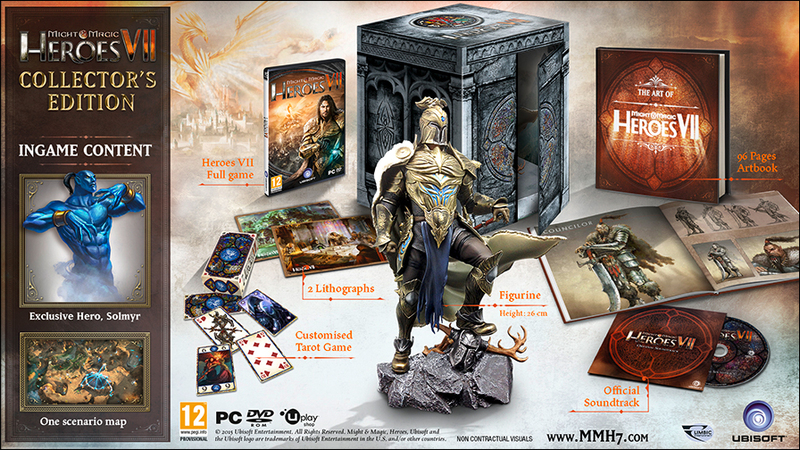 The bundle also comes with an exclusive hero, tarot card deck and a copy of Might & Magic III – HD Edition. If you have never played any of the Destiny content to date, then this edition is aimed at you. 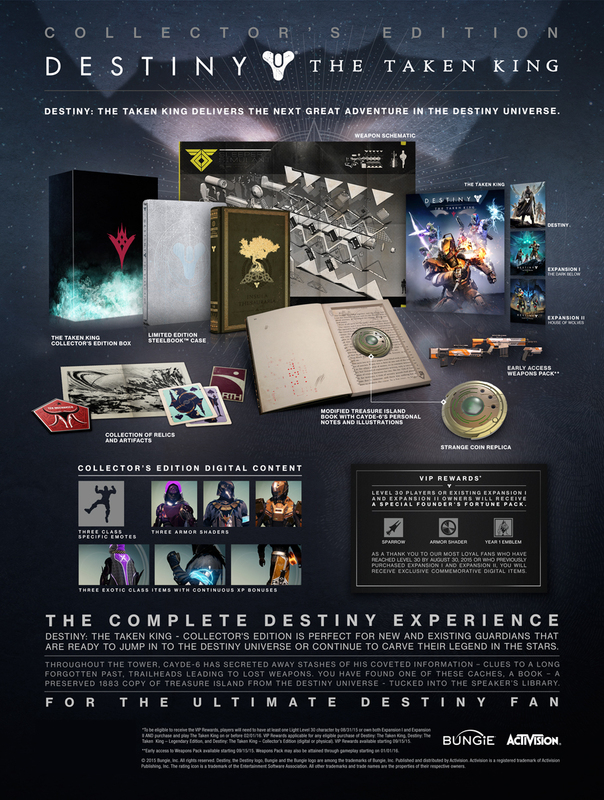 The bundle comes with all of the past expansions, the core game and, of course, The Taken King. It also includes a few other pretty little trinkets. The Taken King Collector’s Edition digital content: includes three Exotic Guardian Class items featuring XP bonuses, three class-specific emotes and three armor shaders to customize each Guardian class. The latest in the Uncharted series comes with probably the only remaster you need to own this year. The Nathan Drake Collection comes with all of the Uncharted titles that released on PS3, all in 1080p goodness. The latest Dragon Quest title is more than just a classic RPG. Having taken inspiration from the likes of Dynasty Warrior, it’s a much more action-centric title. Originally released exclusively for Japan, we will finally get our hands on it this October. The latest in the Tales series takes PlayStation owners on an adventure through a magical realm full of dragons, gallant knights and mystery. The game will feature a brand new battle system called The Fusion System where two character fuse together for more powerful forms – think DBZ or Digimon. 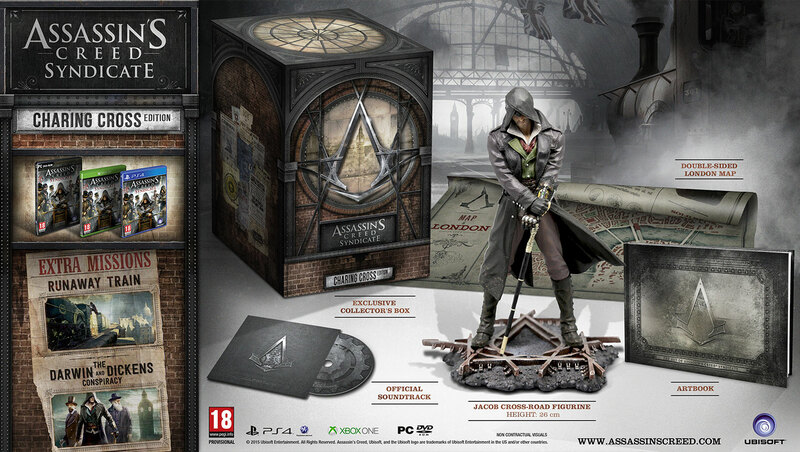 Assassin’s Creed has been known for its great collector’s editions, and this year’s release is no different. Set in London during the industrial revolution, the collector’s edition imagines the world in its day perfectly with its dark box and a figurine depicting Jacob standing over train tracks, perhaps the greatest symbol of the industrial revolution. The Darwin and Dickens Conspiracy: Embark on two pulse-quickening missions that will take you into the inner sanctums of London’s most influential men. Defend Charles Darwin’s discoveries from those who would kill to silence him. And help a friend of legendary writer Charles Dickens keep a secret that could get him killed. Runaway Train: As a runaway train thunders through London at top speed, you must find and fix the train’s critical flaws before you run out of time — or railway tracks. 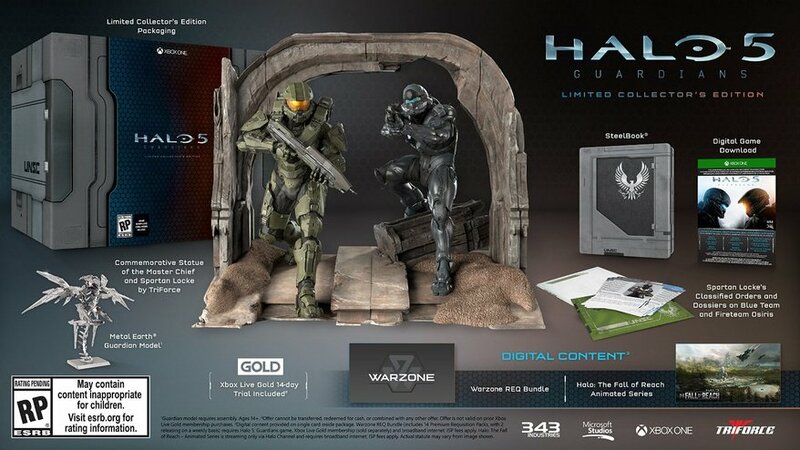 The next Halo is upon us, and this time it’s coming with probably the biggest collector’s edition in franchise history. The prize for all Call of Duty fans, an actual Call of Duty zombie-themed fridge that stores up to 12 cans. 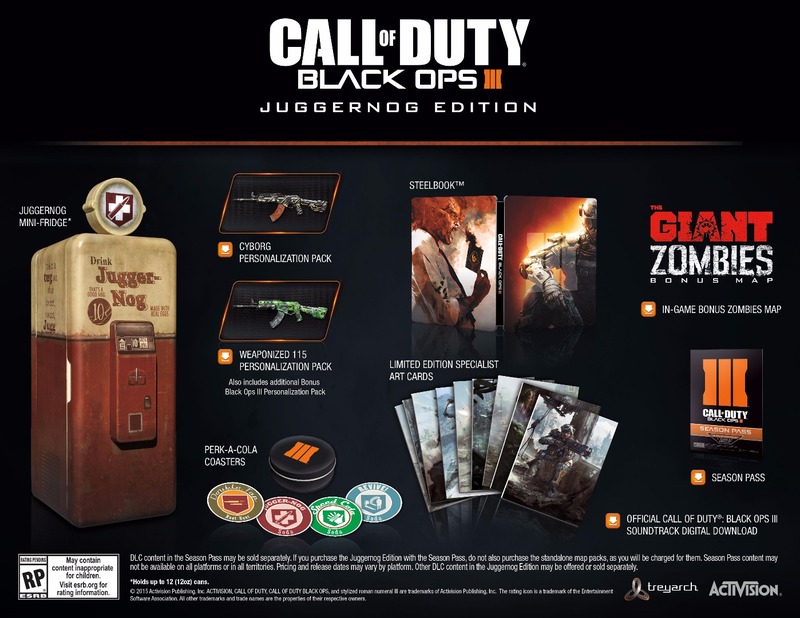 The Juggernog Edition of Call of Duty: Black Ops III is the ultimate version of the game. It comes with the game, the season pass, Perk-A-Cola coasters and additional in-game content. 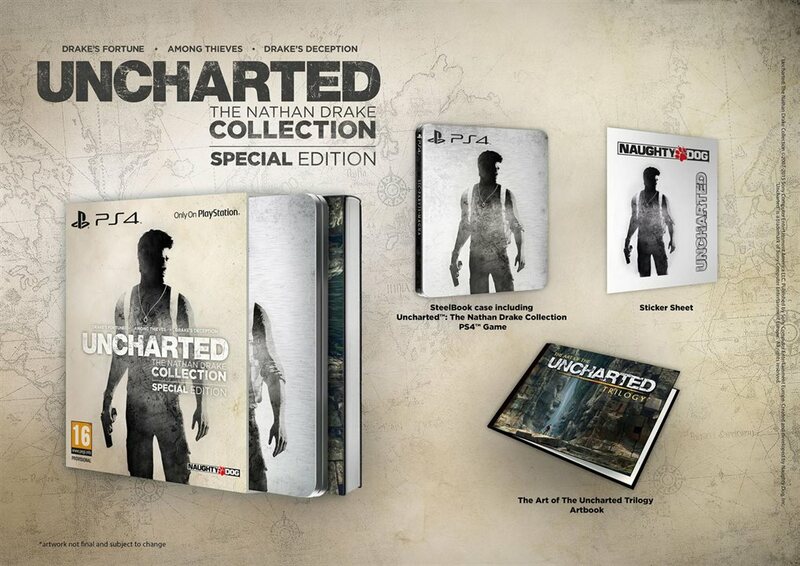 Right now, this edition is sold out worldwide, but just look at it; its perfect! Although sold out completely worldwide, it’s nice to see what you will probably be missing out on as the most anticipated game of the year approaches in a rather epic way. 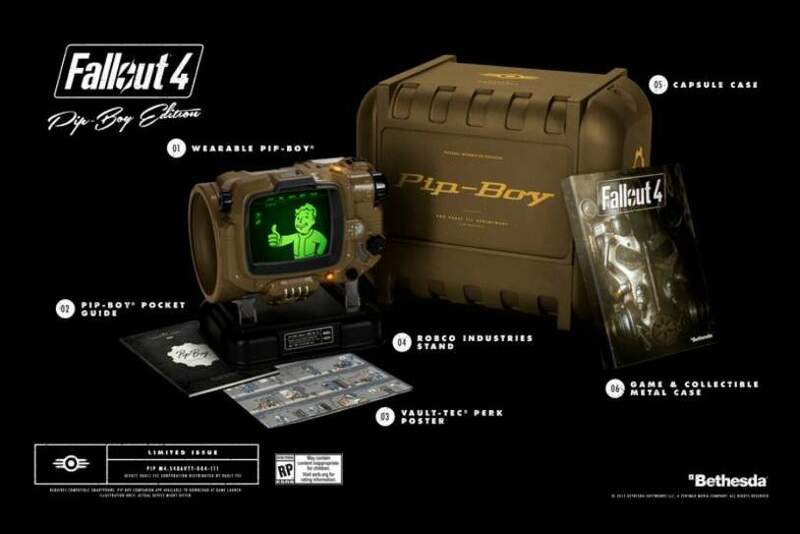 The latest Fallout 4 title will ship in a Pip-boy Edition, with an actual Pipboy. Pip-Boy Replica, Stand and Capsule Case. This wearable device faithfully replicates the in-game model and comes complete with RobCo Industries stand, custom-printed capsule, adjustable foam cuff, rotating knobs and lights. Designed to accommodate a variety of smartphone devices with customizable foam inserts, the Pip-Boy is the ultimate accessory for the official Pip-Boy companion mobile app that allows players to manage their in-game inventory, perks, holotapes, and more. Physical Pip-Boy Pocket Guide. Featuring handy illustrations and chock full of Vault-Tec approved tips, this manual is the ultimate how-to pocket guide for using and maintaining your new Pip-Boy. Power Armor Collectible Metal Packaging. 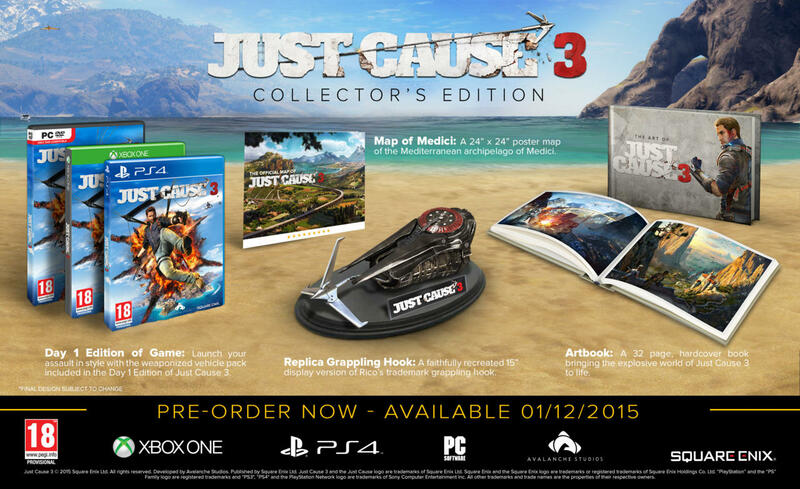 Set the world on fire with Just cause 3 and its collector’s edition. This edition comes with a replica grappling hook that you, obviously, cannot use, but it can stand there and look all pretty. What else are these collector’s editions for? Hardcover Artbook: A 32 page, hardcover book bringing the explosive world of Just Cause 3 to life. Anime fans will love this edition of Naruto Shippuden: Ultimate Ninja Storm 4. 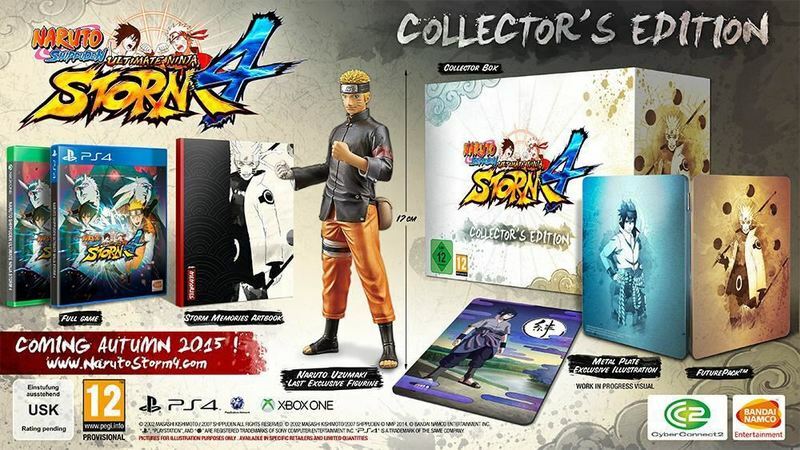 It comes with a 1cm figurine of Naruto, a pretty Steelbook, collector’s box and the Storm Memories Artbook. 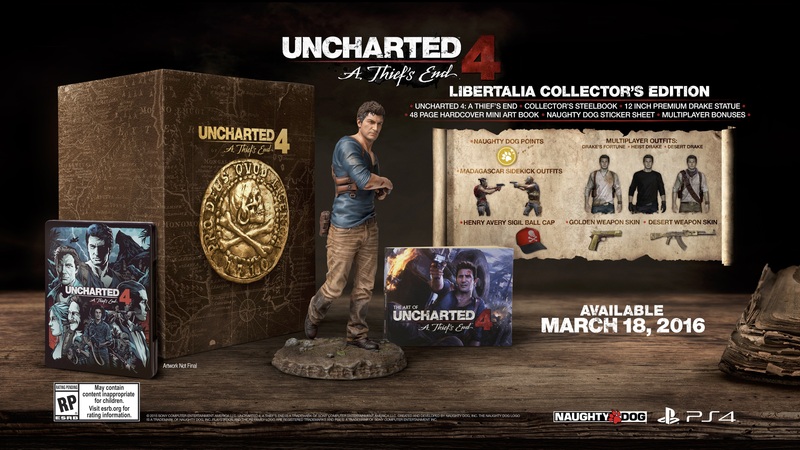 As Nathan’s adventures come to an end, Naughty Dog are releasing the ultimate collector’s edition that will stay in our hearts and showcase forever. 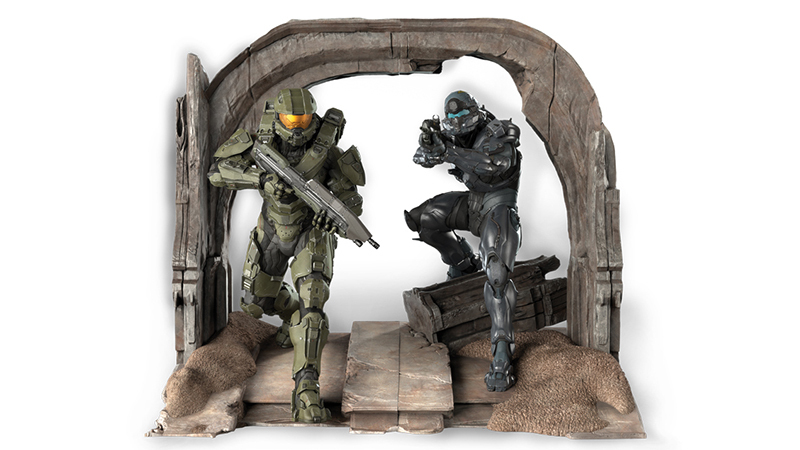 A 48-page hardcover artbook, 12” statue by Gentle Giant, and a pretty box to pack it all in. Naughty Dog Points: redeem the points to unlock new multiplayer content and character upgrades. 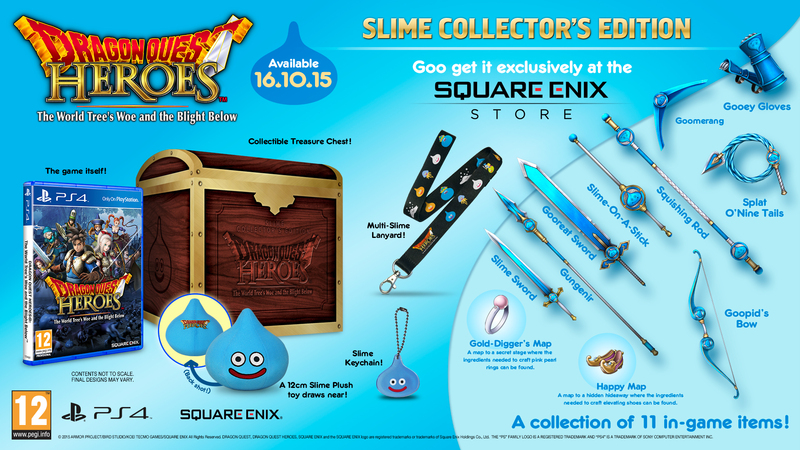 So there you have it, all of the great collector’s editions to spend your hard earned cash on in the coming months. I would say if you wanted them all you would need a good R20, 000. What editions are you picking up? Let us know in the comments and forum.